The Indian Ocean is where global struggles will play out in the twenty-first century. It is a “new great game” in the making. It is these prophetic words that forms the new pivot to the changing strategic dynamics in the Indian Ocean which Robert D. Kaplan envisaged as the ‘Centre Stage for the 21st Century’ whereby in the spiraling rivalry of a rising China and India, ‘Indian Ocean is where global struggles will play out in the twenty-first century’- a “new great game” in the making. With a gradual decline in U.S. dominance, the power struggle seems to have taken its initial roots, whereby both China and India are looking the “Mahanian way” in redirecting their gaze from the continent to the seas. In this view, the Indian Ocean is the new limit to China-India’s complex power politics- where both are determined to make it their nautical backyard. This strategic objective has added a maritime dimension to their geopolitical rivalry. Since the Indian Ocean has become the pivotal region in the economic and geopolitical configuration between the two rising Asian giants, thereby, making it the new security dilemma between the two competitors. This dilemma is created by the ‘defensive moves’ taken by one which is seen to reduce the security of the other. Keeping this context, thereby, to understand the spiraling of tensions, it becomes imperative to assess the stakes that are involved in the two global actors. What makes Indian Ocean a duel ground between China and India is the fact that it is ‘home to important SLCOs (Sea Lanes of Communications) and maritime choke points’ such as the Straits of Hormuz, Babel-Mandeb Strait, Straits of Malacca, Lombok and the Sunda Straits- which form the vital routes for trade and energy (oil and gas) supplies. Together these carry over 50 percent of the world’s container traffic and over 80 percent of the world’s seaborne oil trade travels through this maritime corridor of the Indian Ocean. In this case, any disruption to the sea lines calls for severe security implications for the littoral states, which hinders their economic development. Thereby, to avoid any inherent risks of energy imports and transport bottlenecks, both China and India have adopted strategies such as- pursuing equity stakes in overseas upstream energy projects, building overland or underwater pipelines, investing in pariah states such as Iran, Myanmar, Sudan and others and by establishing Strategic Petroleum Reserves (SPRs). In this view, the strategic interest of both China and India to play an active and dominant role in the Indian Ocean is mainly driven by two factors. First is to procure and secure energy. The sudden rise of India and China as global economic powers has significantly increased their energy needs and their dependence on the Gulf for oil supplies. Since both China and India are heavy energy importers, Indian Ocean acts as the key route for international trade and energy (oil and gas) imports through the sea lanes. For China, 80 percent of petroleum imports pass through the Indian Ocean into the Straits of Malacca, and for India, 75 percent of its oil imports originate from the Persian Gulf and passes through the Straits of Hormuz. In this wrestle for energy security, Beijing’s ‘Malacca dilemma matched with New Delhi’s ‘Hormuz Dilemma’. Thus, this quest for energy security has heightened the direct stakes of both the rising powers in maintaining the security and stability of the Indian Ocean region. Secondly, the ambition for great power status in the Indian Ocean, in order to become a dominant player to project power and gain the freedom of navigation in the crucial waters of the Indian Ocean. In this case, India’s dominant position in the Indian Ocean by virtue of its geographic location and, given its potential to be a great power together with its aspirations runs antagonistic to a rising China’s quest to gain strategic and hegemonic space in an off-shore region. In this great power rivalry, both India and China are engaged in the game of balancing and counter-balancing by means of engaging with each other’s peripheries. Both the powers are pursuing a policy of creating its own web of relationships with the littoral states both bilaterally and multilaterally-by investing in their economies, building ports and infrastructure, providing weaponry, and acquiring energy resources. For example, India is engaging through the ‘Look East Policy’- by economic and strategic engagement with mostly Myanmar, Vietnam, and ASEAN. While China is building its ties through the ‘String of Pearls’, an ‘encirclement strategy’-of which Myanmar, Pakistan, and SAARC are seen to be the most important platforms of exercising China’s Indian Ocean policy. With these motivations, both China and India are involved in flexing their military muscle in the Indian Ocean, which is reflective of their unequivocal desire to improve their ability to combat any kind of perceived threat to their critical sea lanes- which directly pose a challenge to their economic development. Therefore, China and India’s share a common national security strategy which aims to forge a link to the Indian Ocean in order to have unimpeded market access, more direct energy supply lines, and the option of bypassing the dangerous bottlenecks at the sea lanes. To achieve this national interest, both countries have adopted various strategic Indian Ocean policies. In this view, China’s footprints in the Indian Ocean are visible in its surging naval activities by both and soft power tactics to increase its influence. Of which, the most recent activity (January 2014), is observed in the forays of the PLA Navy through the Lombok Strait near Indonesia into the Western Pacific- a navy drill conducted by a three-ship Chinese navy squadron, where the largest amphibious Chinese landing ship – Changbaishan - along with two destroyers - Wuhan and Haikou. This military activity of China is seen as its expansion into the waters in the eastern Indian Ocean, with an ability to operate in the off-shores bases. Chinese Navy’s field activities also include its participation in the joint anti-piracy patrols off the coast of Somalia in 2011 and its ship to ship replenishment exercise in Eastern Indian Ocean in December 2013. While China has deployed three Jin-class (Type 094) nuclear-powered ballistic missile submarines (SSBNs) in active service as of 2007 and is also reported of deploying attack submarines. China has built naval outposts and China-friendly ports, such as- Sittwe and Coco Island in Myanmar, to Gwadar in Pakistan, Chittagong in Bangladesh, Hambantota in Sri Lanka and in Seychelles. Besides these strategic policies, Chinese President Xi Jinping in 2013 has proposed to build a ‘Maritime Silk Road’ to boost maritime connectivity with Southeast Asian and Indian Ocean littoral countries. Similarly, India is expanding its established maritime presence through developing its own network of bases, such as, the Indian naval station, INS Baaz, at the mouth of the Malacca Strait and an envisaged Chabahar port in Iran, which is situated adjacent to the Hormuz Strait. Apart from this, India has also stealthily spanned its interests in the Indian Ocean Rim- connecting with the islands of Mauritius, Maldives, Seychelles and Madagascar and the rim states of South Africa, Tanzania, and Mozambique. India has also beefed up its naval presence by positioning INS Chakra, a nuclear-powered attack submarine (SSN) leased from Russia in active service and the Arihant-class SSBN, a nuclear powered ballistic missile submarine in the Indian Ocean. And most importantly, the launch of India’s first indigenous aircraft carrier Vikrant in 2013 is seen as India’s “ambition to dominate the Indian Ocean” and heralding a greater Indian presence in the Pacific. India’s naval activities are reflective in its multilateral naval exercises (MILAN) with Indian Ocean states such as Seychelles, Mauritius, and the Maldives, along with bilateral naval exercises with Myanmar and Sri Lanka. India has invested some US$5 million for defense-related projects in Seychelles and has installed radar surveillance in the atolls of the Maldives. In an overall assessment, it can thus, be rightly stated that China and India, with their competitive aspirations, are going to shape the contours of twenty-first century global politics which is to be played in the Indian Ocean. 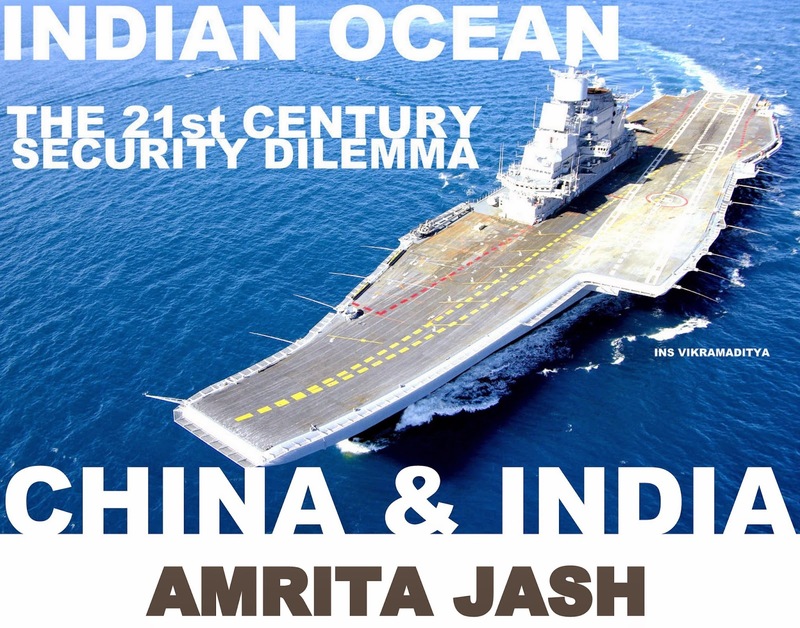 Here, the new security dilemma between the two rising Asian powers is based on championing the sea power capabilities in order to control the Indian Ocean which is destined to decide the fate of Asia. Therefore, both China and India are looking at the ‘Mahanian way’ in the Indian Ocean- the new ‘great game’ of the twenty-first century. This article was first published at Nickled and Dimed (Category- Foreign Policy and Politics & Institutions), Centre for International Economic Studies, Jindal School of International Affairs, O. P. Jindal University, INDIA.